Have you ever looked at the vibrant pink dragon fruit in the produce aisle and wondered what in the world you would do with it? Dragon fruit is the fruit of a night-blooming cactus. It is grown in Taiwan, Vietnam, Malaysia and South America. Aside from that bright pinkish red color, dragon fruit can also be yellow. The fruit may be either white or pink inside, and it’s always speckled with tiny black seeds. The interior of the fruit is entirely edible. You can enjoy dragon fruit raw, cooked or dried. The texture of dragon fruit is similar to kiwi because of those seeds, but the taste is a little like a melon. 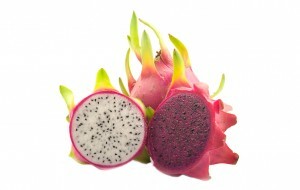 It is difficult to describe dragon fruit to those who haven’t tried it because it is so unique. You can eat dragon fruit just out of hand as a unique snack (after removing the inedible skin!) or you can slice it into a salad, put it in your juicer or use it as a spread. Dragon fruit is also rather high in antioxidants. This strange looking fruit also has health benefits attributed to preventing cancer, reducing memory loss, lowering blood pressure and evening out blood sugar levels. Dragon fruit is good for your skin, teeth, eyes and bones. It also looks pretty awesome on a fruit plate! Look for dragon fruit with bright color. Avoid fruits with a brittle and brown bottom stem which is a signal that the fruit is over-ripe. When you press a dragon fruit with your thumb, it should have a little bit of give to it. If it’s very firm, leave it at room temperature for a couple of days. To eat a dragon fruit, slice it open, lengthwise (it cuts very easily) and separate the fruit from the skin. Enjoy! Cut off the skin of Dragon Fruit and cut it into chunks. Cut the lemon into chunks. Put dragon fruit, lemon, honey and yogurt into blender, blend ingredients and serve. Have you heard about the 30 Day Paleo Challenge? We give you 30 days of paleo dinners, breakfast, lunch and snack ideas. Plus, we have a private Facebook group where I will be sharing tips, answering questions, and helping guide you on your paleo journey! This is perfect for both paleo beginners as well as paleo veterans! Join us here! Today’s focus is on BEETS. Now now! Don’t turn your nose up! There’s way more to beets that the purple gushy sliced things you see decorating salad bars all of over America. 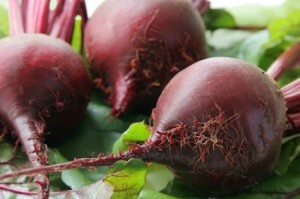 We’re talking fresh beets, the kind that are in season RIGHT now! Raw beets are easy to disguise in a beef and black bean burrito. Ask me how I know. 🙂 My children (now 21 & 19) still don’t know to this day they have consumed many a beet this way! Store unwashed beets in your fridge’s crisper. They’ll stay good for 2 or more weeks! If the beets “bleed” on you, use lemon juice to help remove the purple. Now I don’t know about you, but I know that’s Santa when I read those familiar lines of verse from ‘Twas the Night Before Christmas. 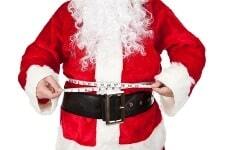 Now Santa may have had a belly, it’s just plain unhealthy-even if your last name is Claus! Belly fat is just the worst-and not just because of the cosmetic reasons why, either. It’s the health risk that’s most concerning. People who are more apple-shaped than pear-shaped (in other words, carry more weight around their middles than on their posteriors), have more fat around their organs (that’s very hard on your body), are more at risk to develop cancer, diabetes and heart disease. That’s not fun, is it? Here’s how to find out if you’re at risk. Measure your waist, measure your hips. The bigger your waist compared to your hips, the higher your risk. Your heart risk goes up as your inches go up. If your waist is bigger than your hips and you need to take this message seriously, especially if you’re a woman. Just remember, there is no magic potion or spot reduction exercise you can do to get rid of the belly fat. It takes work. I’m not going to lie to you, it takes HARD work. That’s hardly earth shattering, is it? You have to eat less (PORTION CONTROL!! ), move more (EXERCISE!) and eat healthier stuff (EAT YOUR VEGGIES!). Like I said, it’s no shocker. I felt this is an important reminder as we are well into the holidays and the greasy appetizers are calling out, the candy comes pouring in from everywhere and the party invitations just seem to multiply. Now isn’t the time to lose body clutter necessarily. This is more a time to think sensibly about maintaining your current weight and not gaining! Be a mindful eater, regardless of the time of year and let’s stay healthy into 2012. Here is a heart healthy recipe to help you and it’s a snap to make, too! Enjoy! Heat a heavy skillet over high heat for 15 to 20 minutes. Mix mayonnaise with 1 to 2 teaspoons of Cajun spice. Taste, add salt, pepper or more Cajun spice as necessary; put aside till later. Lightly oil both sides of the salmon and sprinkle with the remaining Cajun spice (the more you add, the hotter it becomes, so heads up). blackened salmon steak/fillet, 2 slices of tomato and 1/4 cup of the shredded cabbage and serve. SERVING SUGGESTION: Serve with a tossed green salad. This makes about 2/3 of a cup. Keep it in a sealed zipper-topped bag to use again. Get a jump on shedding those holiday pounds with our Break Free Club! So you know you should be eating fish often. It’s good for you. Yet many people are a bit hesitant to cook fish. It’s tricky (or so they think). Well let me ease your mind. Cooking fish is easier than baking a pie – and much better for you. Fish is the ultimate fast food. It only takes about 10 minutes to cook it to perfection. The moment it’s opaque (whitish and not shiny) and flaky it’s done! Fast, easy, and good for you. Who could ask for more? Grilling: Pick sturdy fish for grilling like tuna and salmon. Preheat the grill then use a grilling basket or heavy duty foil. Place fish on the foil and grill. If you wrap the fish in the foil and seal it then you’re steaming and not grilling. Cook the fish for about 4 minutes on each side, depending on thickness. Steaming: After you bring your liquid to a slow simmer, place your fish over the steaming water in a tray. Cover and steam for about 7 minutes. Continue to steam until opaque and flaky. Do not microwave fish. It’s easy to end up with a rubbery mess. Thaw frozen fish in milk in a bowl in the fridge overnight for a fresh taste. Toss out the milk when you’re done. Smell your fish before you buy it. If it smells fishy, don’t pick it. It should smell good, even sweet! NOTE: Start cooking brown rice in rice cooker or on the stove top according to instructions so that when you are done with wraps you can place them in the steamer basket the last 10 minutes of cooking time. In a small skillet sauté shallots and garlic in oil over medium heat stirring frequently for about five minutes. In a large bowl add the cubed fish, shallots and garlic, lemon juice, pepper, salt, thyme and basil. Stack two cabbage leaves, putting fish mixture inside. Wrap and tuck the sides into rolls. Secure with toothpicks. Place in the top container of a rice cooker steamer basket or a bamboo steamer. Steam for 7 to 10 minutes. Heat in a small sauce pan, bringing to boil over medium heat, cooking until reduced by half stirring frequently. 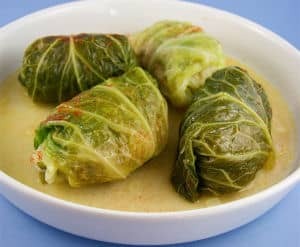 To serve place some sauce on a plate then put the cabbage roll on top. Serve with rice. 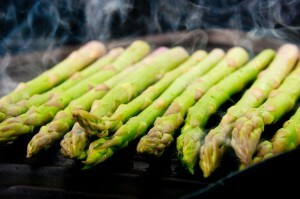 Asparagus makes a nice side with this dish. Yes, you read that right. 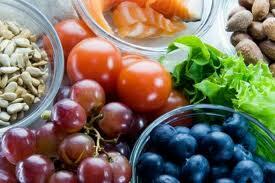 Instead of one food today, the focus is on the many foods that you can eat to help reduce inflammation in your body. If you suffer from any illness, from premenstrual syndrome to arthritis; anything that requires you to use anti-inflammatory medications you should try to eat as many of these foods as possible. Here is just a short list to get you started. Put some mint into your tea to increase the inflammation reduction properties. In addition to the foods listed above you can drink green tea to reduce inflammation. In a large soup pot, put 2 tablespoons olive oil, add green onion and garlic, sauté about 4 to 6 minutes until onion is clear. Add in the rest of the ingredients to the pot all at once. Add water until everything is covered with liquid, if needed. Cover and cook on low heat for about two hours. Season to taste. Serve each bowl of soup with a sprig of parsley. Variations: Mash an avocado or two and add to the garlic, onion mixture right before the rest of the ingredients.